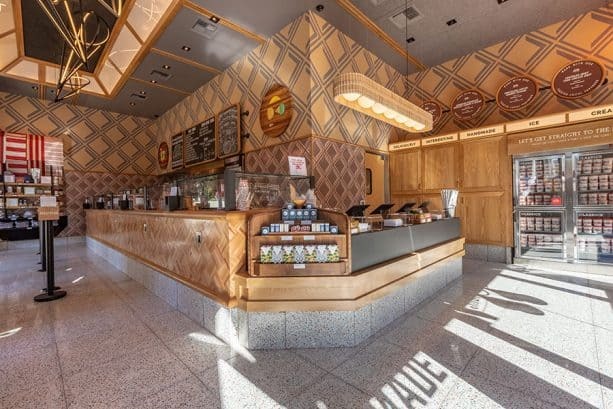 Salt & Straw is now open in the Downtown Disney District at the Disneyland Resort! This scoop shop is the first in Orange County for Salt & Straw, a Portland-based, family-run ice cream company known for its “taste-provoking” flavors. 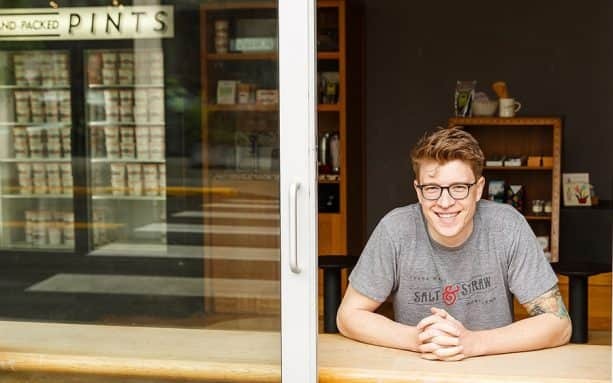 Co-founders and cousins Kim and Tyler Malek created Salt & Straw as a one-of-a-kind experience, encouraging guests to sample through the diverse menu and share a special moment over ice cream. Upon entering the shop, guests are greeted by Salt & Straw’s enthusiastic experts who can lead them on their tasting journey. The shop’s design features an abstract totem pole display of stacked scoops and cones, handmade sculpted lighting fixtures and red-and-white-striped exterior panels to evoke the feeling of a modern-day mercantile. Salt & Straw ice cream offerings are handmade in small batches using local, organic and sustainable ingredients. Monthly specials showcase flavors rooted in seasonality. Guests can enjoy scoops on handmade waffle cones, with fudge and rainbow sprinkles, as well as pick up pints and cones to-go. What makes Salt & Straw unique? We collaborate with artisans in each of our scoop shop communities to create distinctive flavors. We team up with chefs, artists, brewers, coffeemakers, chocolatiers and charcuteriers to craft distinct and amazing offerings. This collaboration is what makes Salt & Straw truly unique. When we create these partnerships, the flavor begins to build a life of its own with a taste profile that provokes guests to ask questions and find out more about the ingredients. For example, we are using cream from the family-owned Scott Brothers Dairy in Southern California. Each flavor is crafted with intention to tell a story about an artisanal product such as Dandelion chocolate, Sightglass Coffee and lavender from the Central Coast Lavender Farm & Apothecary in Paso Robles, California; a peak-season ingredient from a local farm or to commemorate an occasion or holiday. Yes! Our creative process involves seeking out the best-tasting and highest quality seasonal and local products. When we’re looking for new ingredients, we let the local farms guide us, so our creativity is directed by our surroundings. That’s a huge benefit for our research and development process because no matter what we’re serving, we’re always using the best ingredients at that given moment in time. I love taking people on a journey with our ice cream and inspiring them to start thinking about the food around them from a new perspective. We like to say our ice cream is “taste-provoking,” meaning it will not only intrigue your taste buds, but it will leave you wanting to learn more about that specific ingredient or that particular social cause we’re highlighting. We get to use our ice cream almost as a “soap box” to tell stories that we feel are important. I take that very seriously and have used our ice cream to highlight important social causes like reducing food waste, resolving childhood hunger, supporting public education, and talking about basic human rights in our communities. Honestly, ice cream gives us a platform that is incredibly powerful to talk from and it’s exciting to be able to use that power for good. This is your first scoop shop in Orange County, Calif. What does that mean to you and what can visitors look forward to? What also makes Salt & Straw unique is that we change our offerings monthly, debuting new seasonal menus on the first Friday of each month. 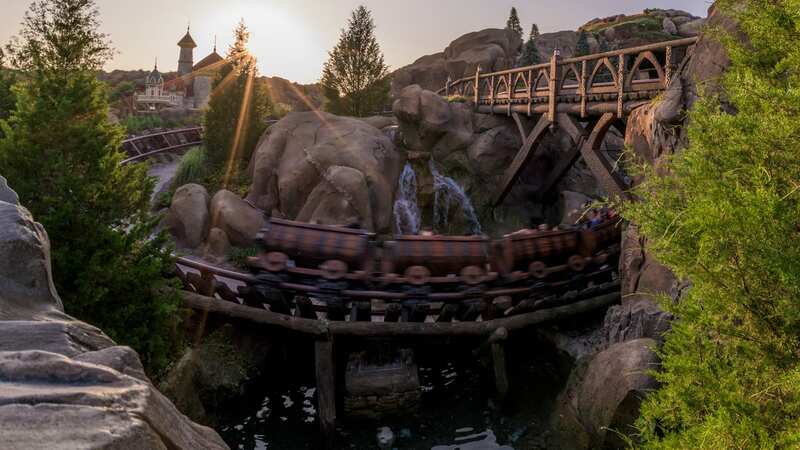 This is incredible because it means every time you visit, you’ll be treated to a brand-new experience based on what is seasonal and salient at that moment. So, when you visit in August, you’ll get to take a tour of Southern California’s various farms through flavors that showcase summer vegetables. Now in October, the Spooktacular series features flavors such as The Great Candycopia and Mummy’s Pumpkin Spice Potion that celebrate the Halloween season. What you get at Salt & Straw is far from a tasting experience and more like a journey through ever-changing stories about food, art and ice cream. 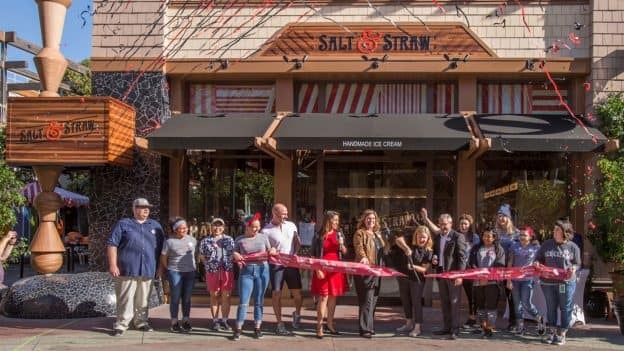 The opening of Salt & Straw is part of the promenade-wide transformation at Downtown Disney District. 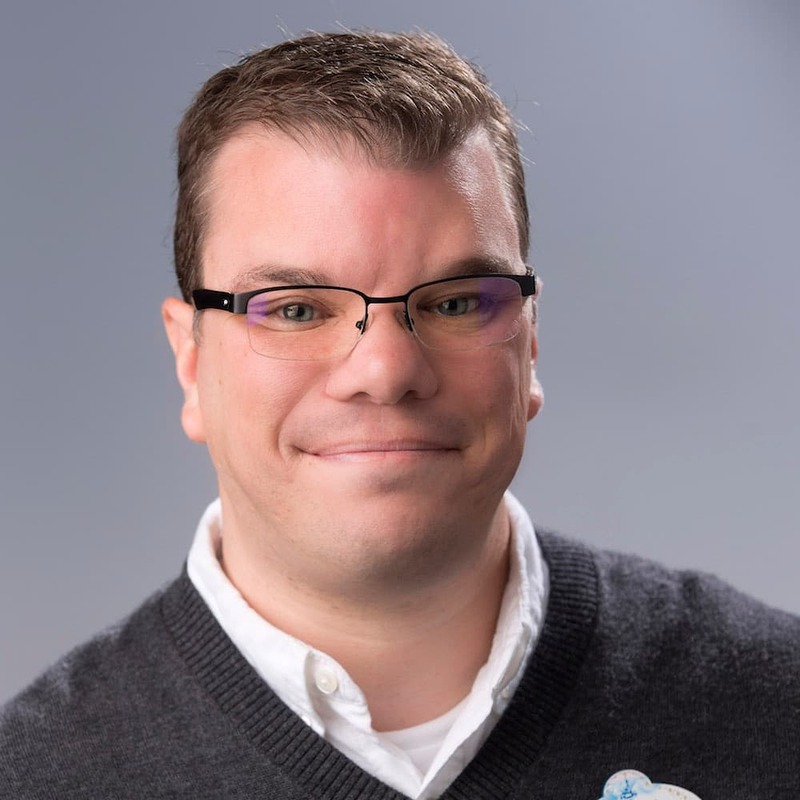 Multiple new venues and refurbishments to dining and retail locations, including the reimagining of the World of Disney store, and openings of Ballast Point and Black Tap Craft Burgers & Shakes. Stay tuned and check back on the Disney Parks Blog for more updates! I know where I will be this afternoon. Can’t wait to try it! do they accept Disney gift cards? I’m looking forward to this next time I visit Disneyland. What a cool concept!